1. Pick what kind of lemon tree you want to grow. Of these three my favourite is the Improved Meyer Lemon. If you have ever tasted a Meyer Lemon you wouldn’t have to ask me why. The fruit is much sweeter than the lemons you buy at the store, still with a classically fresh lemon tartness but with none of the bitterness. You can almost (almost) eat them like an orange they are so good. They skins are thinner, too, I find, and are great for zesting. There is very little pith to worry about. The pith is where much of the bitterness of the lemon is found. I have found that with a little TLC my Meyer Lemon will produce heavily. The picture of the tree above doesn’t surprise me although I know it doesn’t look real. In my first year my Meyer lemon tree gave me 14 lemons. 14! Not bad for a baby, huh? Now, the second year I got zero (I grumble about that here) but moving forward I expect my lemon tree to produce beautifully just like in the picture. TIme will tell. You may also have a choice in the shape of the tree you buy. I bought a standard tree, which means it had been trained to look like a ball on a tall stick. I think it looks more elegant although it will take more upkeep to maintain the standard shape. 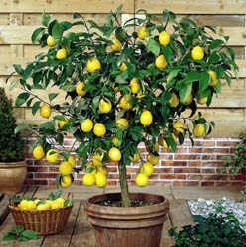 A full grown lemon tree can grow 6′-10′ tall although they will likely be smaller when kept in a pot. But still, a fairly sizable pot is needed, maybe 15-20 gallon pot to start. Lemons need good drainage so make sure there are plenty of drain holes in the bottom. As you’ll be moving it around pay heed to how heavy the pot is. And pick a blue one. 1/3 perlite (although I use vermiculite as that is what I had on hand). When transplanting a lemon tree I like to shake off most of the old potting soil before replanting, just because I know what is in my potting medium recipe and I know it works for my environment. 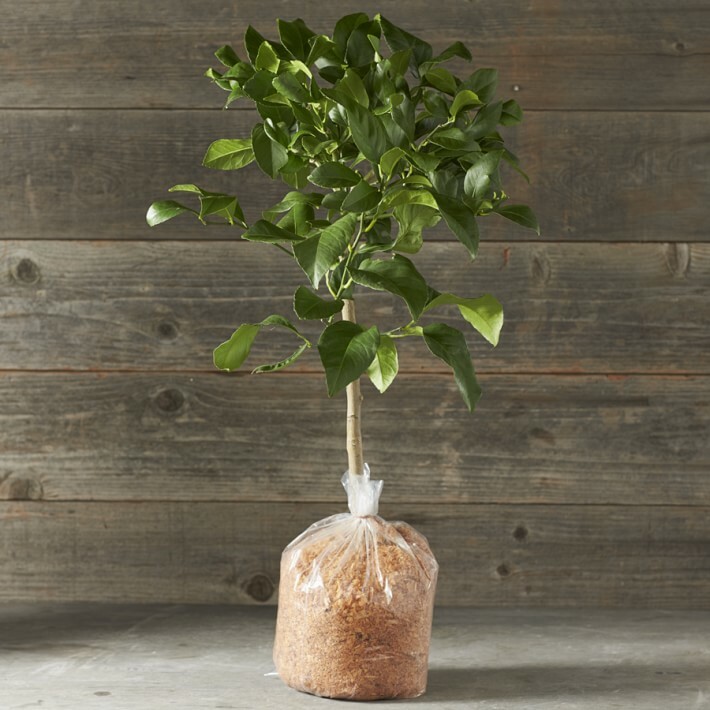 Your lemon tree may also come bare-rooted like this one from William Sonoma. The sawdust is just to try to keep the roots moist during transit. You will shake them all off before you plant this tree. Before planting examine the roots. Cut off any that are damaged or broken, or are circling around and look root bound. Also trim off any broken or dead branches you might see. Place the bare root tree in your pot, gently packing in the soil around the roots. It is important to get the height right. Plant so the roots are just below the surface but that the crown is just above it. Water in well to remove any air spaces and to settle the plant in nicely. ← What to Do with Heavily Variegated Yarn?